I’m often approached by new business owners who want to sell a program or a product online and make money fast. They are looking for a silver bullet, some kind of secret that will make them rich within a matter of months. The common thought is that if you build a product or a program that has value, all you need to do is put a “For Sale” sign out on the Internet and buyers will come. But nothing could be further from the truth. Most people want to grow quickly but don’t have the money to spend on advertising and hiring, so they opt for the third option and try to do it themselves. But what they may miss is that inbound marketing takes time, requires a tremendous amount of effort, and can be a complete waste of time if not done right. Too often, I see small business owners publish a blog or two, send a couple of email newsletters to their database and then get frustrated when their goal of making big money isn’t working. The truth is that with marketing, just like everything else, you get out of it what you put in. So if you don’t have the money to invest in advertising, hiring a sales staff, or hiring an inbound marketing agency, you need to make sure you have the time and the expertise to perform inbound marketing for yourself, or your efforts will be ineffective. In fact, the following are two inbound marketing examples of technology companies, of approximately the same age and size, that adopted inbound marketing as part of their long-term strategy for business growth. However, only one of them implemented it correctly. These are their results. Company A became heavily focused on inbound marketing in early 2015. They retained the help of an inbound marketing company to help relieve the burden of content creation that needed to be done. They produced and published 3-4 blog posts per month, sent 2-4 emails per month, created new premium content every 2-3 months and promoted their content through social media. At the start of 2015 they were seeing approximately 30,000 visitors per month. 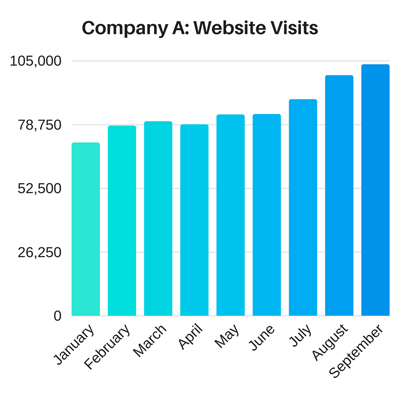 One year later, their website visits had more than doubled. And less than a year after that, they had more than tripled their website visits over the start of 2015. They did even better with their leads. 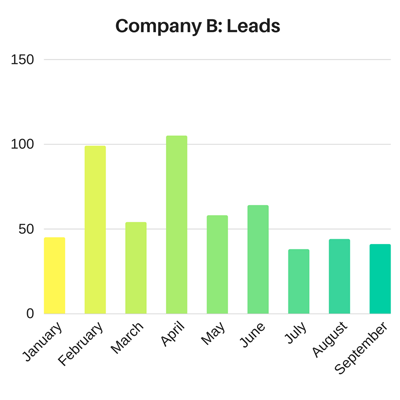 In January 2015 they were seeing just South of 200 leads per month. 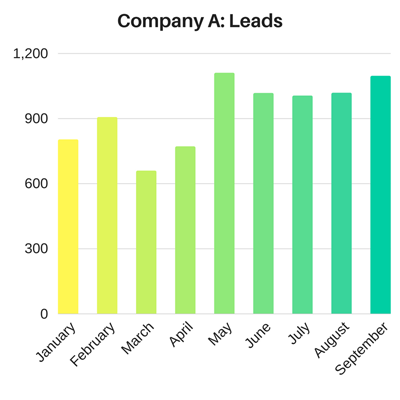 By September 2016, not even two years later, their leads topped out at over 1,000 per month. Take a look a the following charts to see a snapshot of Company A’s 2016 results. Take a look at Company B in comparison. They also got serious with inbound marketing toward the end of 2014 and beginning of 2015. They hired people in-house to manage their marketing efforts and their employees published twice the number of blogs as Company A, churning out two blogs per week! They also sent out emails but with less frequency at approximately one email every 1-2 months, and promoted their content through their social media channels. You’d think that their extra blogging efforts would net them a far better result than Company A, but actually it was just the opposite. 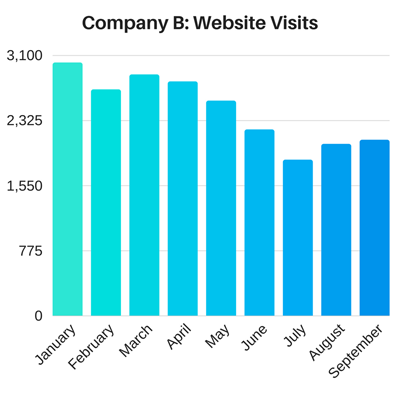 By September 2016, Company B actually saw a net loss of a third of their website traffic since January of the same year! And their leads? Also a net loss over the beginning of the year and in year over year growth as well. You can see a snapshot of Company B’s 2016 results in the following charts. Now, before we analyze what Company A did differently than Company B, it should be stated that numbers alone do not tell the full story of these companies. They naturally had different events and staffing decisions that came up separately from one another, so you can’t rely on numbers alone. However, there are many things that Company A did right that led them to see tremendous growth using inbound marketing strategies that Company B did wrong. Let’s explore them shall we? One of the biggest reasons Company A outperformed Company B had a lot to do with SEO. Every blog post published by Company A had a focus keyword or keyword phrase that was positioned appropriately throughout the article as well as in all the areas that search engines value. 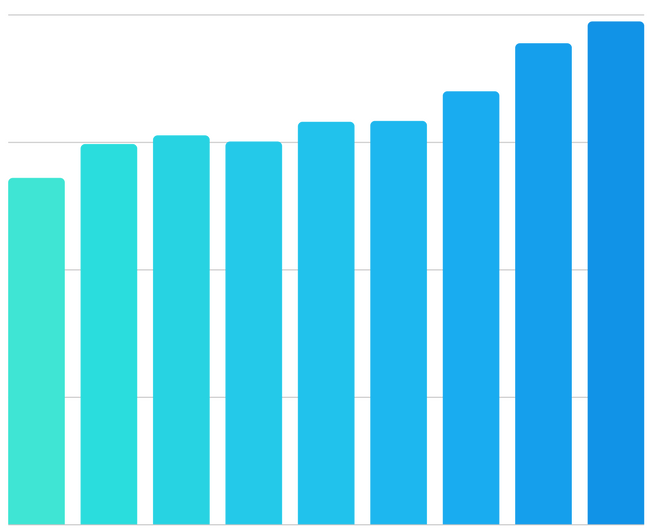 Using SEO best practices helped the company increase their organic search traffic month over month. Company B on the other hand either used poor SEO or none at all, so they benefitted very little from publishing all that blog content. When Company A published a new blog post they would promote it on their social media channels and in strategic LinkedIn groups. Company B did this as well. However, Company A then promoted the same content again, and again, and again over time as the content was still relevant. Company B did not. Company B also neglected to promote their content to LinkedIn groups, one of the best avenues for informational blog content and their social media posting was inconsistent. Since both companies are in the technology sector they offer a demo of their product to help potential buyers envision its usefulness. For Company B, that’s where their free offers ended other than the occasional webinar. Company A however created new pieces of premium content every 2-3 months to appeal to a different segment of their audience. This gave them many more pieces of content to offer to encourage technology seekers to enter into a relationship with their company. They also took it a step further by segmenting those leads according to the content they requested and continued a drip email marketing campaign to further deepen the relationship and encourage a purchase decision. Company A made a point of communicating regularly with their existing database of customers and prospects by sending out emails 2-3 times per month with useful, informative articles and tools. Company B did not have a plan and a strategy for sending emails and would send an email every month or two, primarily to communicate product updates. By the end of 2016, all their efforts helped Company A acquire a database of over 20,000 people in just a few years while Company B struggles to maintain a database of just under 5,000. As you can see from these two inbound marketing examples, how you execute inbound marketing can have a dramatic impact on your company. As a whole, inbound marketing is one of the best ways to increase your digital footprint and generate more leads for your company. But remember, not only does inbound marketing take time and resources to do it correctly, you still may not see a difference in your bank account unless you have a solid plan for following up with your leads. 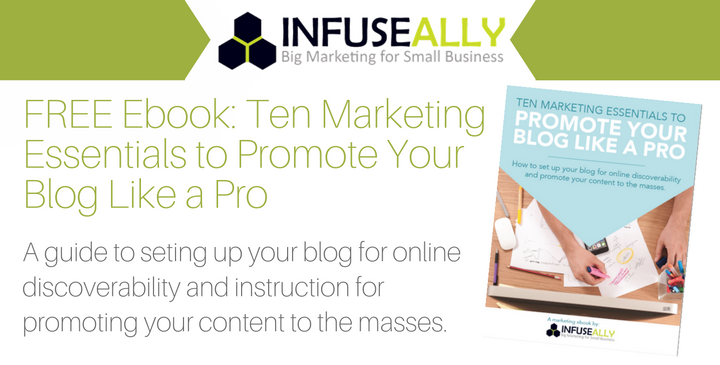 If you’d like to learn how to best promote and leverage your content to make sure you get the results you are looking for, download our free ebook: Ten Marketing Essentials to Promote Your Blog Like a Pro. This entry was posted in Content Marketing, Email Marketing, Marketing Strategy, Online Marketing, SEO, Social Media Marketing and tagged content marketing, inbound marketing strategy, marketing strategy, small business marketing, social media marketing. Bookmark the permalink.